I had lunch today with Brian McElyea who most of you know as the CADFANATIC. 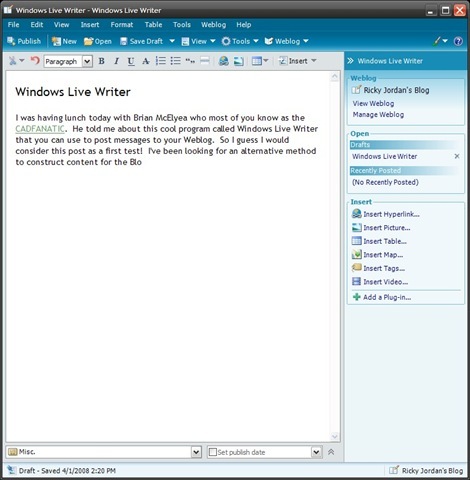 He told me about this cool new program called Windows Live Writer that you can use to post messages to your Weblog. So I guess I would consider this post the first test! I’ve been looking for an alternative method to construct content for the Blog. This looks like a pretty nice little tool. Previous to this I was typing up the post in Microsoft Word, then pasting the content into TypePad after some intermediate steps involving changing settings. It was a total pain! If you Blog….check out this cool tool! It’s FREE! Thanks to Brian for point this out to me! This is a great tool Ricky! I have been using this tool for almost as long as I have been writing my blog. It is awesome that it is used off line. I have noticed that at times that it doesn't upload pictures correctly all the time but for the most part it is a great tool to use. This is a great tool Ricky! I have been using this tool for almost as long as I have been writing my blog. It is awesome that it is used off line. I have noticed that at times that it doesn’t upload pictures correctly all the time but for the most part it is a great tool to use. I'm gonna have to suggest using ScribeFire, an browser extension for FireFox. I’m gonna have to suggest using ScribeFire, an browser extension for FireFox.